Despite regional violence and terrible PR, Mexico’s wealth of offerings to tourists — from pristine beaches, to ancient ruins, to colonial cities, to urban centers — keeps people coming back. 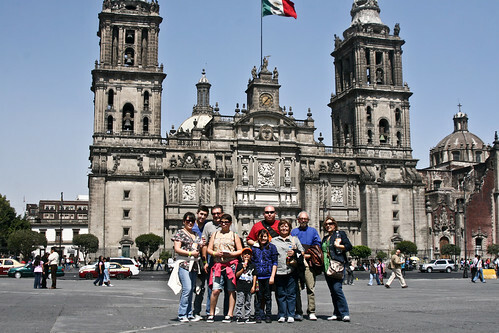 Tourists at Mexico City’s zocalo. Photo by Alejandro De La Cruz. Mexico expects to set a record this year with at least 24.6 million foreign tourist visits, Tourism Secretary Gloria Guevara said. Foreigners’ arrivals should increase by more than 5 percent from the 23.4 million visits received in 2011, Guevara said July 6 in an interview at Bloomberg’s Mexico City offices. “We’re also going to have a better number in hotel occupancy,” Guevara said, without providing further details. Latin America’s second-largest economy seeks to become among the top five international tourist destinations by 2018. The country currently ranks 10th, according to the United Nations World Tourism Organization. “We’re on track” to reach that goal, Guevara said. Mexico’s travel industry is recovering after being hit by concerns about violence associated with drug trafficking, and the 2009 outbreak of H1N1 flu. Guevara, who became the Tourism Minister in March 2010, said that this year Mexico will also register its highest revenue from tourism on record. International tourism is the fifth-largest source of foreign revenue, the Mexican Mining Chamber said in a May report. Guevara said last year that Mexico expected 50 million tourist arrivals and $40 billion in income from the industry in 2018.